Like each breath, your life constantly appears and disappears. 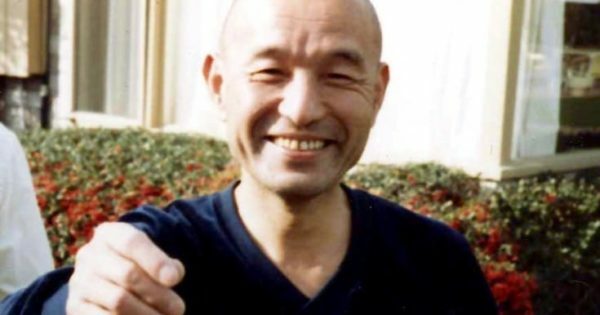 The late Taizan Maezumi Roshi teaches how to do the profound practice of breathing. Taizan Maezumi Roshi. Photo via Stephanie Merzel. My dear dragons and elephants, do you know how many times an elephant breathes? You don’t know? A Japanese scientist found out that an elephants breathes 500,000,000 times in a lifetime. Isn’t it fascinating? Of course, this is merely a statistic. Kindly, he does not say how many times a human being breathes. Usually we say there are three essentials in life: clothes, shelter, and food. Breathing, the most important essential, is not mentioned. Not only do we ignore our own breathing, but we often ignore the breathing of other creatures. Animate and inanimate beings are all breathing. Breathing is a most important dharma. Without this very body, the dharma can’t be appreciated. We must be aware of how this so-called body and mind exist. It is the most mysterious, subtle dharma; everything comes out of it. We humans usually breathe fifteen to eighteen times per minute. We may think that we breathe only through the nostrils or lungs, but actually our whole body breathes. When we meditate, the frequency of our breathing can slow down to one to two times per minute. A baby breathes one to two times per minute in the mother’s womb. So when you cultivate your breathing, your breathing rate becomes just about the same as a baby’s in the mother’s womb. I have been learning about qi gong, an ancient Chinese energy practice dating back some 4,000 years. This practice and wisdom is based on the actual experiences of our ancestors. The Chinese character qi has three main implications. First, “mist” or ether”; second, “breath”; and third, “to give.” When the top part of this character is written with two strokes, it means “to take.” So there is the implication of giving and taking, of balancing. Gong is the way in which we deal effectively with qi in order to derive the most benefit. How can we live in the best way, using and maintaining this precious energy to benefit all of life? Let the qi breathe. Let the body breathe. Let the blood and nerves breathe. Then without any effort, your breath will be relaxed and quiet. Qi is energy. All of us have this energy, and yet some are healthy and some are sick. There is no good or bad energy, no right or wrong energy. Energy is energy. How do we deal with this energy in the way that best takes care of this so-called body and mind? We say body and mind are one. When we don’t understand this as a basic guideline for practice, an unhealthy condition occurs. Sometimes we suffocate ourselves. There is boundless, literally immeasurable, energy to cultivate. The life of each of us is constantly appearing and disappearing in each moment. Life, each moment, is always brand new—this is the way to breathe. So, what are we ignoring about breathing? Zen masters such as Dogen Zenji and Keizan Zenji, the founders of the Soto Zen school, emphasized the essential reasons for practice, but gave little instruction on breathing. From the very beginning of Zen practice, we just cut through to the essence. So instead of paying attention to breathing and appreciating practice in that way, Zen focuses on the essential point of practice. I don’t want you to forget why you practice. What is this life? How do we appreciate our body and mind, which is always the center of this life? In Zen, we say this body and mind is the Three Treasures. We should respect each other as true treasures, literally. This is the base, the foundation, from which I want to appreciate with you how to breathe, how to make ourselves sound and healthy, how to be kind to each other. Adequate breathing has two important characteristics: tension and relaxation. Tension is the sense of contraction or taking in, and relaxation is the sense of releasing. Taking in and letting go. Release is very important. Without a relaxed body and mind, without being at ease, you can’t live in a healthy way. Somewhere you are accumulating something, which will bother you sooner or later. So this balance of taking in and releasing is very important. Please remember that we are not just doing breathing exercises; by breathing adequately, we can live a settled life. We speak of body, breath, and mind, although these are just one thing. Dogen Zenji is very particular about the order: body, breath, and mind. He always starts with the body. In Fukanzazengi (Universal Recommendation for Zazen), Dogen Zenji says, “Just breathe quietly through the nostrils.” If the breath is short, be short. If long, be long. That’s just about what he says. When we examine his instructions, what does “quietly” mean? Breathe through the so-called abdominal area, using the belly. Before we were born, while still in our mother’s womb, how did we breathe? You don’t remember how? Actually, that is the problem! We should remember that most excellent breathing. You have seen how a newborn baby breathes, how the stomach moves. Even the top of the baby’s head breathes. A baby breathes with the whole body. In his instruction on sitting, Dogen Zenji also says, “Think of non-thinking.” Non-thinking is the best expression of how to breathe. How do you take care of this body and mind? Dogen Zenji says that there are all kinds of artificial devices in one’s head. You may think you are doing non-thinking, but you are, in fact, being spun around by your thoughts. Your body and mind knows how to be. Forget about these so-called artificial things. “Forget the self and drop body and mind.” Let the body and mind really be body and mind. Some of you don’t like it when I talk like this. “Oh,” you say, “tell me more about how to breathe.” But doesn’t it make beautiful sense? The meridian that runs from the top of the head along the surface of our body is called the ninmyaku, or “conceptual vessel meridian.” It is located a little under the skin. From the top of the head, there are two frontal meridians: one is down the middle of the body to the abdomen, and another is on the surface of the body. There also are important points, the navel being one. In Chinese medicine, the nin meridian is considered a respiratory organ. Isn’t that interesting? When you practice circulating the energy through these meridians, your entire body breathes. The qi gong masters tell us not to think of breathing through the mouth or nose or even the lungs. So how to breathe? Allow the qi to flow and let the body breathe. It works amazingly well. We think that our lungs are breathing, but that is definitely the most superficial kind of breathing. What is the ideal way to breathe? Make the DNA breathe! When you breathe from your lungs, the breath is very short because you are not using the full capacity of your lungs, perhaps only fifteen to twenty percent. When you breathe, let the entire body breathe and you will notice a big difference in how you feel. In order to make the qi flow easily, your body must be relaxed. Energy simply won’t flow through a tense body. So, relax your body. Starting at the end of the spinal column, let the qi flow up the spine. The movement of qi is very slow, unlike the speed of sound or light. Qi moves about eight to twelve inches per second. When you are not used to moving it, it moves even slower. Let the qi breathe. Let the body breathe. Let the blood and nerves breathe. Then without any effort, your breath will be relaxed and quiet. When we read Zen writings carefully, this is the instruction we should understand on how to take care of body, breath, and mind. There are also two meridians in the back. The tokumyaku, or “governing vessel meridian,” runs through the spinal cord. The other meridian is the jinmyaku, or “kidney meridian,” which runs alongside the spinal column. I personally prefer to use this meridian instead of the governing meridian. It helps me to be more centered. Find the center of your body. Since we are sitting, we are focusing on the upper body, ignoring the legs for the time being. This upper body is called the small cosmic world orbit or the microcosmic orbit. 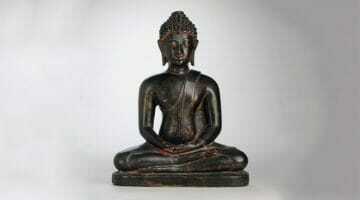 It’s all right to circulate the qi just through the upper body while sitting zazen. When you stand up or lie down, you can circulate it through the legs. In any case, this sense of centeredness is very important, especially in the tanden. Tan means kidan, or “ball of energy,” a jewel-like energy ball. Den is “field,” the place where we nourish or raise this energy. Etymologically, tan means “mercury.” Mercury is poisonous, but, as you know, when poison is used in just the right amount, it becomes medicine. In the past, I explained tanden as the center of the heart or the heart of hearts. Some of the qi gong masters say to visualize light or energy at the tanden, or points of concentration. So, for instance, if you visualize the jewel-like point, that point grows. In qi gong, the energy ball practice is emphasized more than breathing itself. For our practice, I am focusing on breathing. Handle the energy as if it is a ball. Of course, it’s not a ball, but again practice as if it is. Our practice is the same: we practice as if we are bodhisattvas, as if we are following the Enlightened Way. The point is to realize that each of us has a wonderful life. Dogen Zenji talks about this as the self-fulfilling samadhi. Our life is already the fulfilled life. It is our responsibility to take care of it. We usually speak of the tanden as the lower abdomen, but the qi gong masters talk about three tanden: upper, middle, and lower. The lower tanden is located about two and a half inches below the navel and two and a half inches in from the skin. Some masters talk about tanden as a pinpoint, others as a general area below the navel about four inches in diameter. I think both the general area and the special point are important. In Zen practice, we emphasize the lower tanden. Keep your attention on this tanden. When you have this kind of point, it’s not a thought. You are not thinking about other things. Just bring your attention back to a point. It’s meaningful action because you are not engrossed in your own busy head. It takes time to be comfortable with these practices, but it’s fun. The area called kikai is about one inch below this lower tanden. Ki means “energy” and kai means “ocean”—the ocean where energy is stored. Kikai covers the intestines, and is a more general area rather than a particular point. The kikai is a little more passive, the tanden more active. In fact, you can feel the pulse quite strongly above your navel, but below the navel, you cannot find a pulse. Try it now. Press your finger below the navel. Regardless of how deeply you press, you don’t feel the pulse because the area consists mostly of small intestines. An interesting point relating to the small intestines is that in Chinese medicine the small intestines are called the second brain. Perhaps the human brain developed as an imitation of these intestines. Before that, the intestines of our earliest ancestors were their body and mind all together. Literally billions of years of life are condensed into nine months in the mother’s womb—all emerging from tiny cells. Dogen Zenji expresses it in an interesting way: “Two drops of white and red getting together to form life. First of all and last of all, empty.” Within this emptiness, we all have this energy. The middle tanden is located about two inches inside the center of the breast. For me, the upper tanden is as interesting as the lower tanden. The upper tanden is located about two and a half inches behind the third eye. In other words, the center of the upper tanden is in the brain. Do you know how many billions of cells are in the brain? We use just about ten percent of our brain in our lifetime. And do you know how fast these cells are changing, old cells dying and new cells emerging? We simply can’t believe the enormous speed at which these changes occur. It is a shame how these parts are not utilized more. I mentioned the meridians that circulate qi. A meridian runs through the center of the upper, middle and lower tanden. The lower tanden is generally below the navel, but with this center meridian, this particular lower tanden is located about two inches behind the navel. Let the centers of all three tanden be in a straight line. This means, of course, that you must have proper posture. In Dogen Zenji’s Fukanzazengi, he instructs that the “ears and shoulders are in a straight line, and the nose and belly button are in a straight line.” When you sit in that position, the center of the upper, middle and lower tanden will be in a straight line and the qi will flow efficiently. Dogen Zenji used the words “right body in straight sitting.” In zazen instruction, we always place the tip of the tongue against the roof of the mouth. I discovered that by putting the tongue against the upper ridge, the tongue becomes a bridge for energy to pass through this meridian. So bringing these three tanden into a straight line, move the energy along the spine all the way up to the top of your head, then bring it down through the center of the upper tanden, through the middle tanden, and then to this lower tanden. Another type of breathing is to let the qi flow down the front of the body. Most importantly, let the qi flow all over the body. Usually we are just aware of our limited respiratory system. We think that our lungs are breathing, but that is definitely the most superficial kind of breathing. What is the ideal way to breathe? Make the DNA breathe! That is the best kind of breathing. See for yourself what happens when the qi flows throughout the entire body. Just as you once breathed through your navel in your mother’s womb, use the meridians to breathe and let the qi circulate. Let the qi breathe. Allow this qi to take care of your body and mind. When doing these practices, don’t do too much at one time. Be at ease. Avoid creating too much tension in your head or in your heart. Have good concentration along with your practice of breathing, just sitting, koan, or whatever you are practicing. And trust yourself—not the self you think you are, but as you are. Before we move on to breathing practices, let me first say a word about adjusting the mind. In qi gong, several points are mentioned that correspond to our practice. Qi gong masters speak of the “liberation of the mind first.” We must “knead” or “temper” the mind. Second, “leave or go away from knowledge.” In other words, forget the mind’s usual activities. In Zen we emphasize realizing the unity of body and mind, of oneself and others. It is necessary to keep away from our restricted, discriminative conditioning. So leave the discriminative wisdom alone for awhile, set it aside, and focus on realizing the unity. The qi gong masters say zabo, or “sit forgetting the self.” Sit quietly, calm the conscious mind, forget this “I.” We are always dealing with this very moment. Right now. How do we appreciate this? I encourage you to spend the first ten to fifteen minutes of sitting doing a relaxation or releasing practice. This has three purposes: one, to release tension; two, to remove toxins; three, to energize the body and mind. By visualizing, we are not just following energy as such, but sensing the structure of our life. I am condensing qi gong practice to one point: how to breathe. Figuratively speaking, the main part of qi gong is imitation—to imitate a certain way, an ideal way in which this life is one with the whole world. Learning is a process of imitation. By doing so, it becomes your wisdom. What do we imitate in doing zazen? The lives of the buddhas and ancestors. Dogen Zenji says that zazen is “imprinting the Buddha seal upon your body, breath, and mind.” Furthermore, “sit straight in samadhi,” the state of forgetting. Even sitting is forgotten. When you do that kind of zazen, the whole universe becomes the Buddha seal, and all the ten directions in the dharma world become satori itself. You go beyond imitating buddhas and ancestors and directly confirm your life as the Buddha seal. This is breathing. Pay careful attention to relaxing your brain. Our brain carries all the knowledge from billions of years ago. The relaxation practice is divided into three parts: the sides of the body, the front, and the back. First, start from the top of your head. With each exhalation and inhalation, slowly move down each side, to the neck, shoulders, arms, elbows, finally letting the qi flow out of the fingers; second, inhale and exhale as you move slowly down the front of the body; third, from the top of the head down through the back—release the tension. When you breathe out, make a sound within yourself, then let it go. By concentrating on one part of the body at a time, it is easier to release tension. For instance, release only up to the temples in the first breath, to the sinuses with the next breath, then down to the eyes, and so forth. Hakuin Zenji taught a breathing exercise in which one visualizes a substance like butter slowly melting down the body from the top of the head. So inhale and exhale slowly into each part of the body. Relaxing the whole body in one breath doesn’t work. The more you concentrate on one part at a time, the more effective this practice will be for you. When you do it, you will sense how you are letting go of yourself. Pay careful attention to relaxing your brain. Our brain carries all the knowledge from billions of years ago. Isn’t it marvelous, this literally inexhaustible potential and power that we all have? The knowledge that we have accumulated since our birth is very limited. We are using such a small portion of how much is actually there. Qi gong breathing vitalizes all the cells, genes, and nerves. I want you to develop the use all of these ancient parts of the body by letting the whole body breathe. When relaxing the front of the body, use the upper tanden. Bring your whole attention into the center of the brain. This upper tanden is also called echu, the “center of wisdom.” It’s at the very center point of the head, about two inches straight behind the third eye. Visualize this point. Place your conscious awareness at this point, then move that awareness down through the middle tanden and down to the lower tanden, which, in this case, is behind the navel. Let that point be the very center of your whole body. Just about opposite the navel, on the back, is a point called meimon, the “light gate.” This lower tanden is located between the navel and the meimon. Remember not to force yourself too much. Don’t overdo these practices. As I mentioned, resume your regular practice of breath counting, just sitting, koan, or whatever. Real strength should come out of softness, a kind of tenderness. The more we make our body flexible and soft, the more we can create samadhi. Everything is the function of energy. Our life is a life of constant change. Dogen Zenji says our life changes 6,500,000 times per day. And yet, each moment is one unbroken movement. This is the action in which life is maintained. When you see life from this perspective, the self is forgotten and, as Dogen Zenji says, you are confirmed by the 10,000 dharmas. Live your life in such a way. Each of us is equally the same as the dharma, as the Buddha, as the sangha—as the so-called Three Treasures. Right now, here, this is our life. Taizan Maezumi Roshi was a pivotal figure in the transmission of Zen Buddhism to the West. 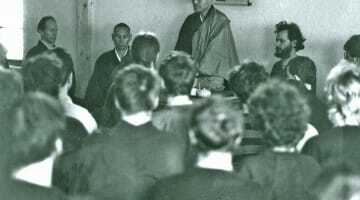 Ordained as a Zen monk at age 11, he moved to the United States from Japan in 1956. 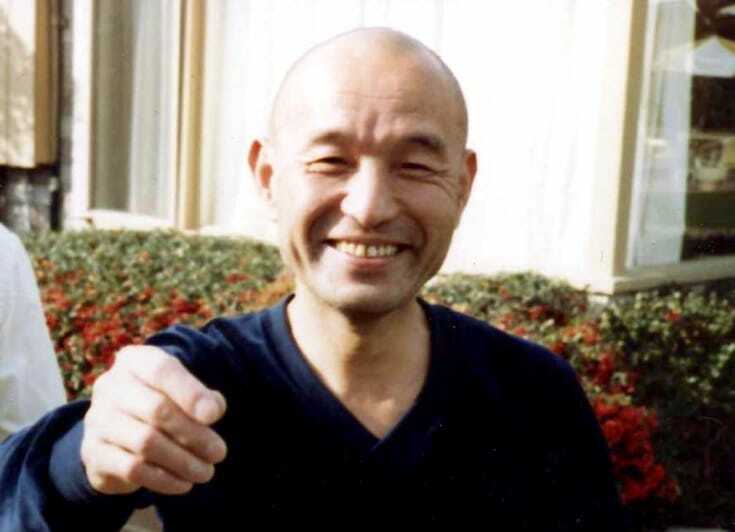 Maezumi Roshi was founder and abbot of the Zen Center of Los Angeles, and founded five other Soto Zen temples in the United States and Europe. He transmitted the dharma to twelve successors and established the White Plum Asanga to carry on his lineage.